News, information, and resources from our home presbytery. Note that this Website was recently updated with better navigation and more information. A source of information about our home synod that includes links related to presbyteries in the Synod and to the national church. The official Website of our denomination. The site includes news, programs, resources, and information about the PC (USA). 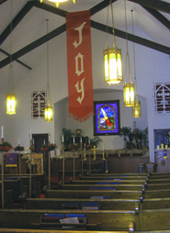 It has an extensive set of links for the Presbyterian Church and related sites. A network of Presbyterians “working for a church that is simultaneously faithful, just, and whole. We seek to support the mission and unity of the Presbyterian Church (USA) in a time of potentially divisive controversy. We intend to articulate and act on the church's historic, progressive vision and to work for a fully inclusive church.” The site includes a newsletter, resources, and information on the network itself. An organization of conservative Presbyterians dedicated to promoting an evangelical perspective in the Presbyterian Church (USA). The site includes news, articles, resources, and links. Looking For a Presbyterian Camp or Conferene Center? Or you can click here for a complete list of camps and conference associations for the entire country. The Website for a leading Presbyterian news publication that includes news items, articles, editorials, and special features related to the Presbyterian Church (USA). A Presbyterian publishing house that includes catalogs, study guides, and some free resources.